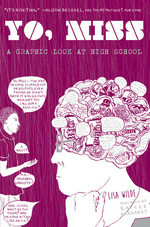 Last month, we felt lucky and stoked to publish Yo, Miss: A Graphic Look at High School, Lisa Wilde’s nonfiction graphic novel about teaching at an inner-city second chance high school. Since then, the rest of the world has been falling in love with the book just like we did—it’s been getting glowing reviews, and readers are quickly picking it up and keeping it close. I asked Lisa some questions over email about her road to publication and some back story and updates to the stories in the book. Before Yo, Miss was a book, it was a series of comics zines. What led you to start making those, and what was the transition to traditional format publishing like? Yo, Miss is my first book. I’d never drawn cartoons before, and I turned 60 this past summer – all of which fits with why I teach at Wildcat. In many ways, what the school is about (and what I hope the book is about) is confronting stereotypes. In other words, the potential that is inherent in all of us that just needs a little help or the right circumstances to allow it to come out. In society’s eyes, I have no credibility in terms of making a graphic book, much less getting it positively reviewed. In society’s eyes, most of our students are perceived a little like Ellison’s invisible man—either as a threat or not seen at all. What we at Wildcat try to do is to allow our students’ potential to come out, and challenge whatever stereotype society wants to place on them, along with the stereotypes they may place on themselves. The idea for Yo, Miss was always as a graphic book. This choice may have been because I was inexperienced, but I also had nothing to lose by dreaming big. And once I started making Yo, Miss, the process was so interesting that finishing it was never in question. Publishing was a whole other deal. During most of the process, there wasn’t time to think about anything beyond what I was doing. But at a certain point, I realized I wanted to see if I could get this out into the world in some way. I was given Microcosm’s name by another publisher, so I contacted Joe and he asked if he could publish Yo as a series of zines. I said yes immediately, and then went to the Internet to find out what a zine was. Once I found out, I was thrilled. Joe, for me, was someone who saw my potential outside of stereotypes, and for that I am eternally grateful. And then he took the next risk, which was to publish it as a book. Having Yo come out as zines before it came out as a book was incredibly helpful for me in many, many ways. Between the performances and other promotion, I got a much better idea of how to move this book out into the world, which is something very different than making the book. What next? Will you be drawing more Yo Miss comics? Will you continue (or are you still) teaching at Wildcat, the second chance high school depicted in the book? Other big projects on the horizon? What’s up next? I always feel like the air space above Kennedy Airport around 7:00 in the evening – all those planes circling around waiting to land. My second book—Lacunae: a Diary in Pictures—is just about ready to send out. It’s another book with words and drawings, though it isn’t in comics form. (And unfortunately it’s not up Microcosm’s alley. All the drawings are color, and there are a lot of them.) The images are visceral, emotional and archetypal—kind of a combination of Charlotte Salomon, Jean-Michel Basquiat, and Jung. I hope to get the dummy of my third book, Noah and the Boa Dance Round the World (a children’s book), completed by the end of summer. I’m not going to even mention the idea for the fourth book (but it is great!) My biggest issue is time. I still work full-time at Wildcat – and love it, though (as I described in the book) I am almost always tired. There’s a tug of war right now about the future of public education in the US. If you were spirited away today to Washington to give policy recommendations to the president, what would they be? If I was asked to give policymakers advice in terms of public education, I would say three things: 1) use standardized tests as one narrow measure of success instead of the defining concept, 2) do the math and see that standardized testing and technology are not cheaper solutions in terms of improving educational performance (and recognize that their connection to improving performance is also questionable.) and 3) take some of the money poured into standardized testing and technology and use it to reduce class size, increase noncore classes like art, music, dance, school sports, etc., and provide meaningful classroom support to improve classroom teaching. Because of what has happened with computers, the world is in a seismic shift in terms of using data to inform decisions. However, society is still in the early phases of this shift and too often data is seen as meaningful simply because it is data i.e. 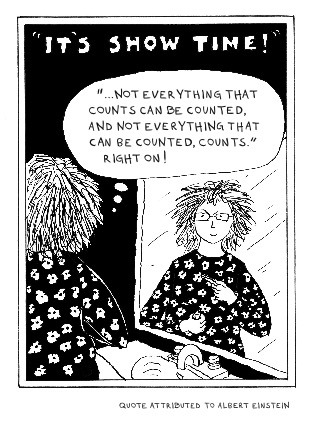 a score on a standardized test = what someone knows, whether the test is meaningful or not. Going along with that (and this is why I begin the first chapter with the quote attributed to Einstein) is the idea that things that aren’t easily measured must not be valuable. If academic growth is the only value for education, society loses. Reading Yo Miss, it was easy to get attached to a lot of the students. Can you share any “where are they now”s with us? As you probably know, the students in Yo, Miss are fictionalized composites. I did that for confidentiality, but also I tried to be as true to who our students are as possible, and most characters had many models. We have had many students like Danny, the boy who kept calling me “Snowflake.” One student, Joe Garcia (who called Oedipus “stupid”) is now a union electrician, making more money than me. I spotted another Danny model on the subway awhile back. There was a kid sitting across from me, deeply involved in a thick hardback book. It looked like one of our graduates, but the kid wouldn’t look up—he was so into the book—so I couldn’t be sure. Finally, when he reached his stop, our eyes met and it was indeed Keith Wooten—former bane of every Wildcat staff member. Tyrell Bramble, whose poem Life and Times of Young Rellington is recited by Will, was back visiting Wildcat a few weeks ago. He’s now a nurse. However, I don’t mean to give the impression that it’s all positive. Another model for Will—a student who we all loved who dropped out before graduation—was killed by 23 bullets in a gang hit. Jessica De La Rosa, the model for Janis Diaz (the student who has osteogenisis imperfecta), graduated from John Jay College and on April 16th she and I are going to be at CWE, a branch of City College, talking about the book and the importance of challenging stereotypes. Jessica is an inspiration and a force of nature—foster parenting three disabled children, competing in national rowing events, and promoting disability rights. She is also a dear friend. This interview with Yo, Miss author Lisa Wilde is part of a series of interviews with Microcosm authors. The last interview was with Katie Haegele and the next one is with Andy Singer.